A heavily illustrated introduction to the skills you need to become a crocheter, Basic Crocheting begins with the yarn, hooks, and other tools you need to get started, and then moves on to cover the skills you need to make a wide variety of home accessories and wearables. Detailed instructions for every step of each project are supplemented with helpful photographs and illustrations. Sharon Hernes Silverman is a writer and crochet designer in West Chester, Pennsylvania. She is also the author of Tunisian Crochet (978-0-8117-0484-7), Crochet Scarves (978-0-8117-0081-8), Crochet Pillows (978-0-8117-0646-9), and Tunisian Crochet for Baby (978-0-8117-1287-3). Knitwear and crochet designer Annie Modesittâ€™s designs regularly appear in magazines such as Interweave Knits, Vogue Knitting, Knitterâ€™s Magazine, and Cast On. She also sells her patterns through Ravelry and her website anniemodesitt.com. Annie teaches knitting and crochet classes around the country, and also offers online classes at knittingheretic.com. She is the co-owner of ModeKnit Yarn, a line of hand-dyed yarns and yarn kits (modeknityarn.com). 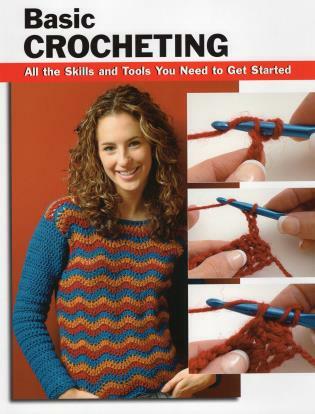 She is the author of numerous books and was a contributor to Beyond Basic Crocheting (978-0-8117-3392-2). She lives in St. Paul, Minnesota. Follow her on Twitter (@modeknit) or on Facebook (Annie-Modesitt-Knitting-Heretic). Alan Wycheck is a concrete specialist and former partner in The SO Factory, a concrete design company. He is also an award-winning photographer and lives in central Pennsylvania.